This week I have mainly been getting into embroidery, I found my embroidery hoop whilst tidying out a cupboard - it has rained a lot here so I had to find something to do! 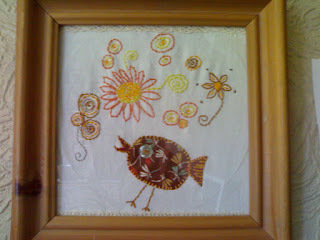 I haven't used it since I was at college and had a white vintage sheet that warhammer paint spilt on some of it so instead of throwing it out i have been making cushions, this little birdie was too lovely to use for a cushion so I framed him instead. 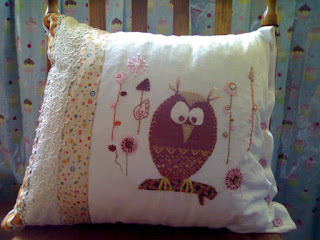 Meet Henry the applique owl, he is my first cushion I made, I got the lovely retro ribbon from a little craft shop in my town, its full of all sorts of pretties and very inexpensive, I spend way too long browsing for things in it, so my boys tell me! This one is for my mum, she adores flowers and I wanted to make her something really pretty so I edged it with vintage lace and pearl beads. 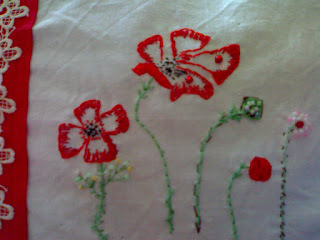 I have added beadwork to the embroidery too and Im really pleased with the result, she is coming over tommorrow to collect it, she only knows I have made her something so i hope she will like it. Sometimes as a mum it can all get you down with the kids arguing, the constant "I'm Bored" and the whinging but then things like this happen and it makes the day so much brighter. 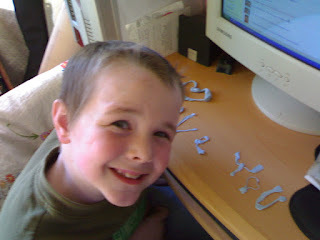 There was a shout of "Mummm" from the front room, and as I hear that at least a few hundred times a day, I wondered what it was this time, so imagine my suprise and overwhelming joy when my little guy had made me this out of bluetack! I just had to get a picture, he was so pleased with himself for making me smile so much, but he makes me smile lots of times everyday, he says the funniest things that have us in fits of laughter, things like after playing with water "mum, do i have blood shock eyes? ", or when we was having a serious grown up talk about the future I asked him what he wants to be when he grows up and he said after much contemplation " a tortoise". 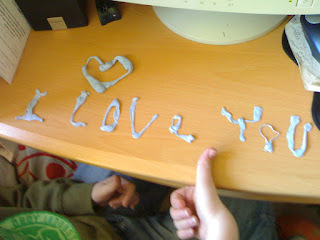 Its the little things like this that makes me so proud to be a mum and makes all the whinging worthwhile. 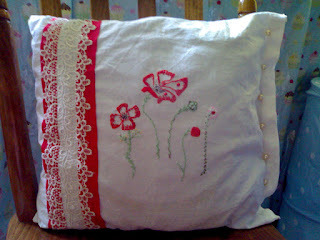 Beautiful embroidery! 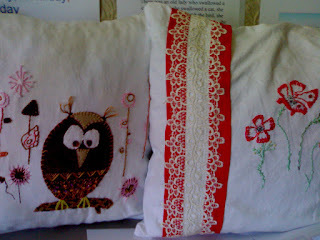 You are very good with the needle and thread.